Huggins & Scott Auctions – Hey Hey! 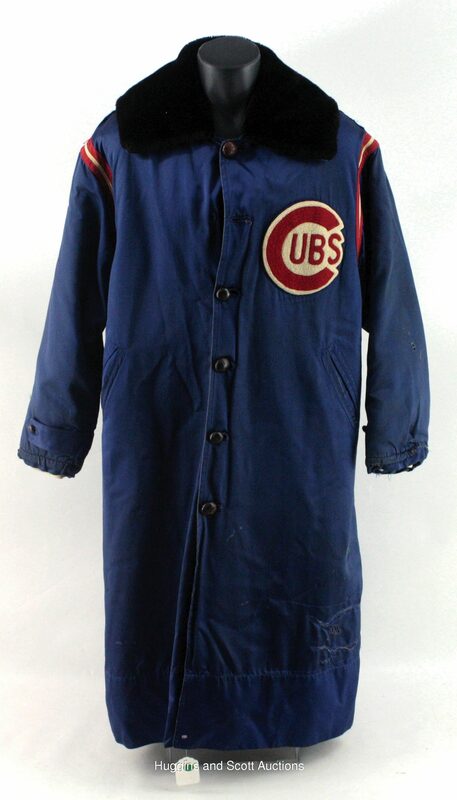 Braving the Chicago elements during the 1950s, a Cubs player wore this jacket during cold weather contests. The lengthy blue satin-like button-down garment features a “CUBS” logo sewn to the left breast in red-and-white pile. Red-and-white striped trim lines the shoulders and a hanger is intact within the 7”-wide fur collar. The item features two front pockets and shows extensive wear with several vintage team repairs. Additionally, one of the original buttons is missing and there is partial separation of the leather-based wool lining. I know $250 starting bid is a ton of money, but if I was a Cubs fan… I’d stop buying lattes for a year and buy this sucker in a heartbeat. So pimp. This entry was posted in Baseball, MLB and tagged Chicago Cubs, Cubs, cubs jacket. Bookmark the permalink.